This year’s Exercise, Blue Slalom, aimed to provide an opportunity for Officer Cadets to train in alpine skiing. For some, it was their first-time skiing, others had skied before and for a few, who were already advanced skiers, it offered the opportunity to develop new skills through the SF2 training program. On the 4th January, 43 Officer Cadets arrived at Falklands House and after kit was issued started the 24-hour journey to Les Deux Alps. After having the rest of the day upon arrival to relax it was an early night in preparation for a week’s ski training. The next morning, we were up at 07:30 and after a shower and breakfast were split down into groups according to previous skiing experience. Having skied a few times before, but several years ago, the weeks skiing re-introduced me to the correct techniques and allowed me to develop quickly under qualified supervision. The week started on a gentle green slope and ended with some impressive reds. The individual groups all progressed at an equal rate, always at the pace of the weakest member so that no one was left behind or left out. The group quickly bonded and each day was progressively more fun as we became more confident in ourselves and our skiing improved. At the end of the week, everyone was either qualified with the SF1 qualification or the senior SF2 qualification which looked at emergency drills such as what do in the case of an avalanche. The weather was perfect with bluebird for most of the week. At the end of a day’s skiing and a good supper, Officer Cadets had time to relax and socialise with several socials organised by the group leaders. Deux Alps offered the perfect location for training with a huge range of slopes and a lovely French town in which to base ourselves. 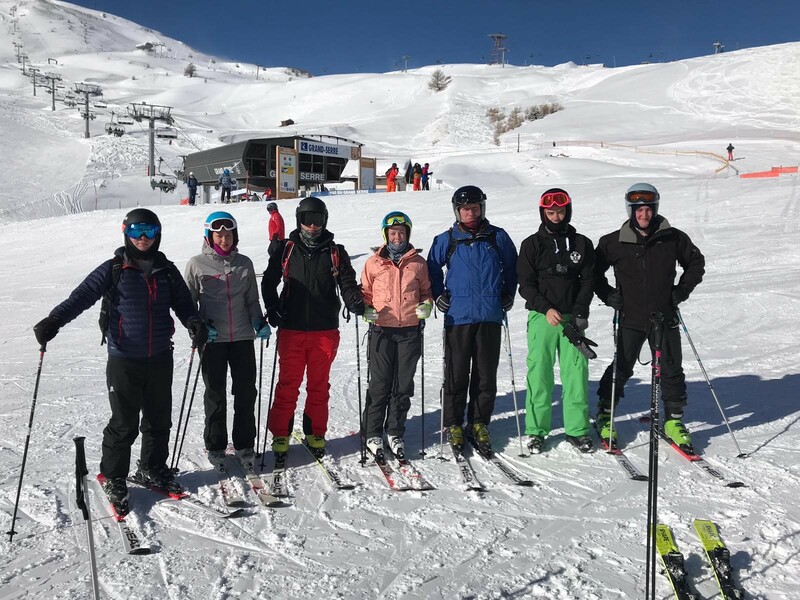 The Officer Cadets, many of whom had only joined Oxford UOTC a few months before the exercise, all bonded over this week and everyone had a very enjoyable time both on and off the slopes. 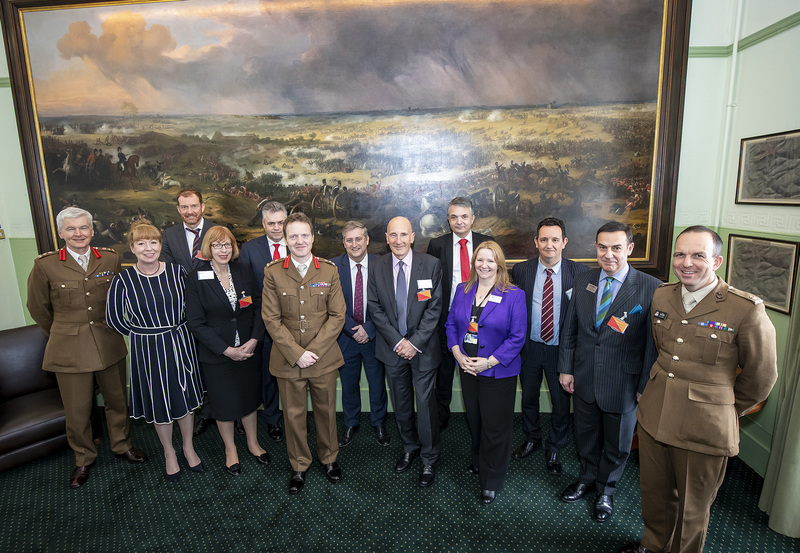 On the 06 March 2019, Employers who are Gold Recognition Award holders as part of the Employer Recognition Scheme were invited to the Royal Military Academy Sandhurst (renowned worldwide as an establishment of excellence and is held as an exemplar on the subject of ‘Leadership’) for a Luncheon and talks on now the Army approach Leadership vs how a civilian organisation in this case Southern Gas Network approach leadership in their organisation. Alpine Adventure is a one week Skiing expedition to Bavaria, Germany during the February School half-term break and supports 100 cadet places for the experience. The expedition is open to any cadet, but places are grouped to fill the 3 lodges used on the trip. Each Coach group occupies a separate lodge in the Allgäu area of Bavaria, where the cadets are accommodated, joining them from a wide variety of locations and Squadrons. The expedition costs are kept to a minimum by using land transport and self-managed accommodation & catering, group rates for Ski Equipment and passes as well as utilising RAFAC staff volunteers, all of whom are giving up their time for the expedition and who individually pay to retain and support the holding of their qualifications to lead cadets in the Skiing environment. Staff have trained and qualified as Alpine Ski Leader (some are BASI 1 or 2) to safely train cadets in skiing. Additional staff are used as sweepers in the ski groups and are used for other driving and supervision duties during the trip. During this years’ expedition, the cadets enjoyed some of the best snow we have seen along with clear blue skies and uninterrupted sunshine…. What a trip!! During the day, cadets were split into groups of 8 based on skiing experiences and were led around by our ASLs. They all got to ski much of the mountain and, during the week, we moved to other local resorts to enhance their terrain experience. After the days’ activity, the coaches went their separate ways to the lodges for the evening meal , followed by another activity. 10 pin Bowling and Swimming were arranged off site as well as a quiz and film night on site at the lodges. The final fling was the Gala night on Thursday where all the groups converged to a local hall where presentations and group photos were completed followed by Party acts from each of the groups. This year; to mark the retirement of one of our founding members, former Wing Commander A.J. “Barney” Bruce RAF (Ret’d); we celebrated the presentation of the Barney Bruce Award, presented to the cadet who had contributed the most to the week both on and off the slopes. The winner was Cadet Sergeant Ashlea Hickman of 2374 Sqn in Kent. All together after a full skiing program; some 100 cadets and 20 staff embarked the coaches for the journey home; from Bavaria, through Germany to Luxembourg, Belgium and France, they finally split on the Quayside at Dover to return home for a well-earned rest. Despite last weekend’s chilly weather three cadets from 1440 (Shoreham-by-Sea) Squadron came a step closer to realising their dreams of gliding when they spent the day at the former Battle of Britain airfield at RAF Kenley in Surrey. Corporal Michael Gray (14), Corporal Rosie Dyett (13) and Cadet Joseph Ramet (15) travelled to Kenley, the home of 615 Volunteer Gliding Squadron, to become the latest in a long line of Air Cadets to pass through their doors to begin their gliding experience. Gliding is one of the RAF Air Cadets core activities and the team were at Kenley to beginning their training to earn their “wings.” The three spent time in the hanger with qualified gliding instructors, looking over the two-seat Grob Viking T1 glider that has been used to fly cadets for many years. They learnt about how the aircraft gets into the sky and more importantly what keeps them there without engines! They also learnt how an operational gliding airfield works and how they fit in to the bigger picture. Passing the Ground School element of their gliding training means that the team can now progress, take to the air and put into practice some of the things they learnt in the coming months. Do you think you’ve got what it takes to be an Air Cadet, Adult Volunteer or member of our Support Committee? 1440 Squadron are keen to recruit young people aged between 12 (and in Year 8 at school) to 18 as well as adults who are keen to help us deliver the best opportunities to our cadets. Interested? Drop us an e-mail at 1440@aircadets.org or visit our website www.1440sqn.org. The 254 Ski team were an unknown entity; comprised of those who had responded to the Defence Connect call for interest but skill levels for now unaccounted for! The team comprised of Maj Susie King, Capt Dan Worley, WO1 (RSM) Paul Stockwell, SSgt Dave Roffey, Cpl Alice Phillips, LCpl Trustram-Eve, Pte Josh Ager and Pte Jake Halls. It had been short notice between receiving the Admin Order, getting a Business Case through and all the preparatory admin required to secure the team 2 weeks training. It was a long drive over to the Alps but travelling at night and in two cars rather than vans, went surprisingly well with the team arriving in resort by 07:30am on 27 Jan 19. The organisation and MCCP for the exercise was very slick and it wasn’t long before we were recovering from our long journey and settling into our lovely alpine accommodation, with a delicious home cooked evening meal by Pte Ager. Thank you to those who funded us, supported us and of course the skiers for pushing themselves in the competition. As we have just reached the end of the year in which commemorations to mark the Centenary of the Great War came to an end, I wanted to write up the amazing experience that some soldiers and ex serving members of 142 (QOOH) Vehicle Squadron got to experience in November 2018. The history of the Queens Own Oxfordshire Hussars (QOOH) is something that is held highly within our squadron given that we still hold the honorary title of QOOH, so I would like to reflect on the personal impact that a visit to the battlefields of WW1 had on individuals both young and old who attended. We started the tour at the ARC in Banbury where 30 of us headed off towards via Maubeuge, France via the Euro Tunnel. Maubeuge is a town of approx. 30,000 people in northern France, situated on the banks of the Sambrea a stone’s throw from the Belgium border to the North. The evening of arrival on the 7th of November is ours and many take the opportunity to sample a few of the local bistros, bars and fortifications that surround the city. An early start on day 2 sees us head up head to Rifle Wood, where the QOOH had seen action on the 1st April 1918 (Two days after the battle for Moreuil Wood fought by the Canadians), this was a decisive part of the war for the QOOH, known as ‘The Last Great Cavalry Charge’, for obvious reasons. There is a memorial not far from Rifle Wood on the southeast side, erected by the Canadians in 2004 to remember their men who died at Moreuil and Rifle Woods, and which includes a plaque commemorating the QOOH men who fought at Rifle Wood. Serving Members of the squadron laid a wreath in memorial. Following this we headed to the joint Canadian/UK memorial for a tour of the site and to look at the immense size and scale of what was in place. On day 3 saw we visited the Flesquières museum. An amazing experience and highly recommended if you can go, which comes with an amazing story of how the tank was found. For six years a man searched, dug, read archive reports, war reports and files to find the tank that was supposedly buried in area after succumbing to German fire. Eventually after years of searching he found it buried 2 metres down and they dug out a Mark IV Deborah tank, buried whole. The tank is now on display at this purpose built museum for everyone to see, and it is truly amazing to look at. From the museum we visited the Flesquiéres Hill Commonwealth War Cemetery, here we spent some time to reflect on the ages of some of the soldiers and officers who had fought within the area. From Flesquiéres we headed back to the hotel to prepare for a tour and meal in the Angelus brewery, Erquelinnes. A very interesting evening unfolded which ended rather late…. On the fourth day we headed to visit the American Memorial and Graveyard at Bony, a staggering 14.3 acre cemetery containing the graves of 1,844 of military dead. From Bony we drove to Guillemont Farm. Guillemont Farm is something that all members of the QOOH have at least minimal knowledge of due to its importance. It was here that Major Valentine Fleming (father of Ian Fleming) and two other officers were killed in 1917 along with many QOOH soldiers. It was very rainy and windy when we visited the farm, and it only added to the feeling that this would not have been a very nice place to have been whilst under constant German offensive. We got back in the minibuses and headed to Templeux-Le-Guérard Commonwealth War Grave Cemetery. Here we left crosses at the graves of QOOH soldiers who died in the area. Old, Macey, White, Bleloch, Cox, Saunders, Buckle, Podbery, Baylis, Lovejoy, Buswell, Ayris, Thompson, Silvertop and course Fleming. That evening we were invited to the 2018 Armistice Gala Concert in Erquelinnes, the focus of our battlefield study. The evening was a grand event of music, dancing, local beer and food which went on well into the night. It was a great evening and the town Major of Erquelinnes made us feel very welcome. The final day, the most important. The Centenary of the Great War coming to an end. I had the great honour of riding a somewhat reluctant horse through the town of Erquelinnes. It was here on the final day of the war that the men of the QOOH rode in on horseback to liberate the town. There is a photograph of a QOOH Soldier on horseback with the backdrop of a local shop behind him which was replicated to mark the occasion before we marched front and centre of the procession to the Erquelinnes Communal Cemetery, paying homage to the fallen and laying a wreath for all soldiers who had fought and died in WW1. The day ended with an Armistice ceremony in the town square, where both speeches and gifts were exchanged between the QOOH Association and both the Town Major of Banbury (who sent a gift over with us) and Erquelinnes. After a beautiful silence, we were lead from the square, carrying the local beer and wine provided to a massive banquet in the town hall to celebrate the centenary of the Armistice. The Battlefield study was amazing and insightful, I really enjoyed it, following the history of our squadron through the final months of WW1 was invaluable and now when we parade with our colours through Banbury I can really understand the battle honours bestowed onto it. I think all who went on the study can thank those who organised it and indeed 165 Port and Maritime Regiment for allowing 142 Squadron to conduct this Battlefield study alongside the Regimental run one that happens each year. I’d say to anyone who hasn’t been on a Battlefield study to get on the next available one, seeing what happened during WW1 puts most things into perspective. 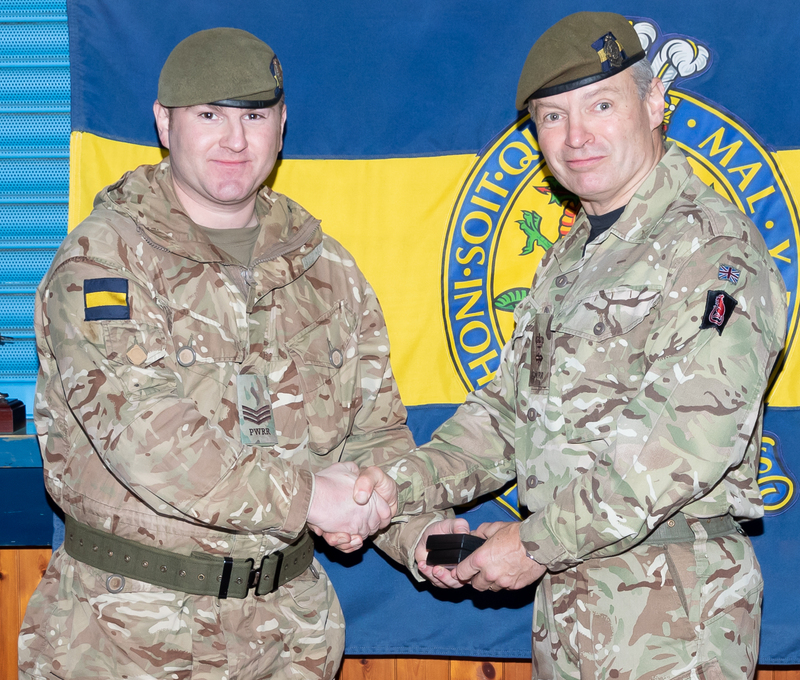 Sergeant (Sgt) Michael Bell currently serving with local Army Reserve unit, the 3rd Battalion, The Princess of Wales’s Royal Regiment, known as the TIGERS has been awarded two medals for his operational service. 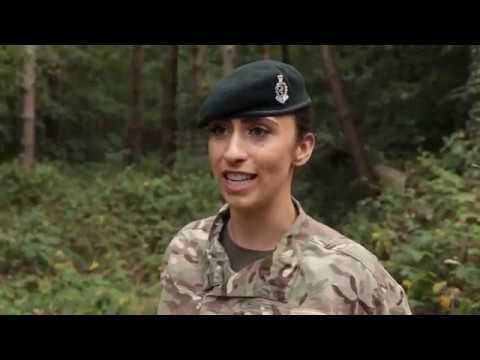 Sgt Bell, 32 from North London and is a member of the 2nd Battalion, The Princess of Wales’s Royal Regiment (PWRR); however is posted into the local reserve unit as a Permanent Staff Instructor (PSI). He is based with A Company 3 PWRR at Manston, Ramsgate but also covers military duties at the platoon outstation in Ashford. Sgt Bell has served with the Regular Army since leaving school and follows in his older brother’s footsteps. He has seen operational experience in Kosovo, Afghanistan and Iraq as well as deploying overseas several times on exercise. Sgt Bell has been presented with a further two medals. These are in recognition of his time spent in Iraq serving on Operation SHADER. This is a training mission where the British Army is deployed to assist with the training of the Iraqi Army. Sgt Bell spent six months in the country as part of the training team; there he taught the Iraqi soldiers both basic skills as well as some more specialised skills. Some of this reflected the high level of training that he himself received from the British Army and they benefitted from the experiences that he has also had from his past tours of duty. The second award was in recognition of his accumulated service. The Accumulated Service Medal is award to individuals who have completed more than 720 days on operational service. Sgt Bell achieved this during his time away on Op SHADER. Sgt Bell has about another year in his post with 3 PWRR before he will return to 2 PWRR his parent unit. 2 PWRR has recently re-roled into one of the new Special Infantry Battalions of the British Army. These help to deal with the various training missions that are currently being undertaking across the world. He will no doubt be able to take with him plenty of instructional experience from his time spent with the Army Reserve. 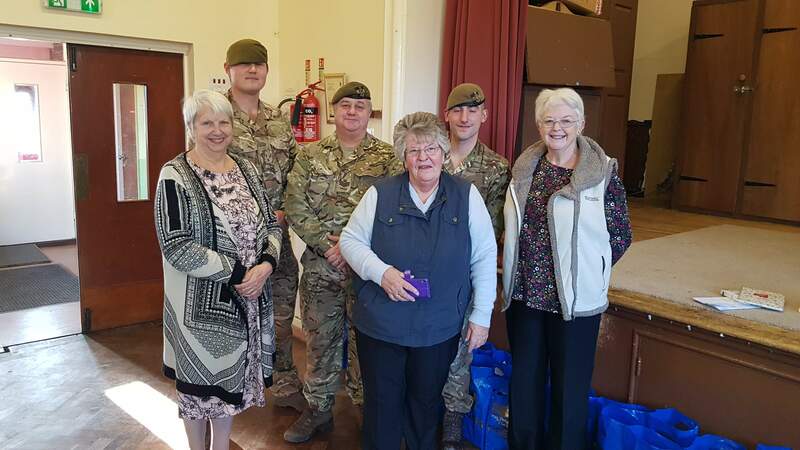 The Community Engagement Team from the 3rd Battalion, The Princess of Wales’s Royal Regiment, also known as the TIGERS have been busy over this festive period. After another successfully Battalion Christmas Carol Service; held at Canterbury Cathedral they have switched their attention to those less fortunate. Colour Sergeant Paul Harris, 52 from Canterbury has been a member of the Army Reserve for 35 years. Based at the Headquarters at Sturry Road in Canterbury, he has been busy canvassing local businesses to help sponsor his initiative to help both the local OAP’s and the children’s ward at Canterbury and Ashford hospitals. Over the last week, he has delivered food hampers to the Herne Bay and Northgate Community Centres. He has also put together children’s packages full of colouring books, colouring pens, pencils and other activities to help keep the youngsters occupied plus a thank you hamper for the hardworking nurses on the children’s wards in Canterbury and Ashford hospitals. These have been distributed by local soldiers and officers based in the two locations. The 3rd Battalion is the local Army Reserve Infantry unit based across the South East of England. They are always looking to welcome new recruits; so, if you are looking for an exciting, varied and paid spare-time occupation go and see them. Open evenings every last Wednesday of each month. 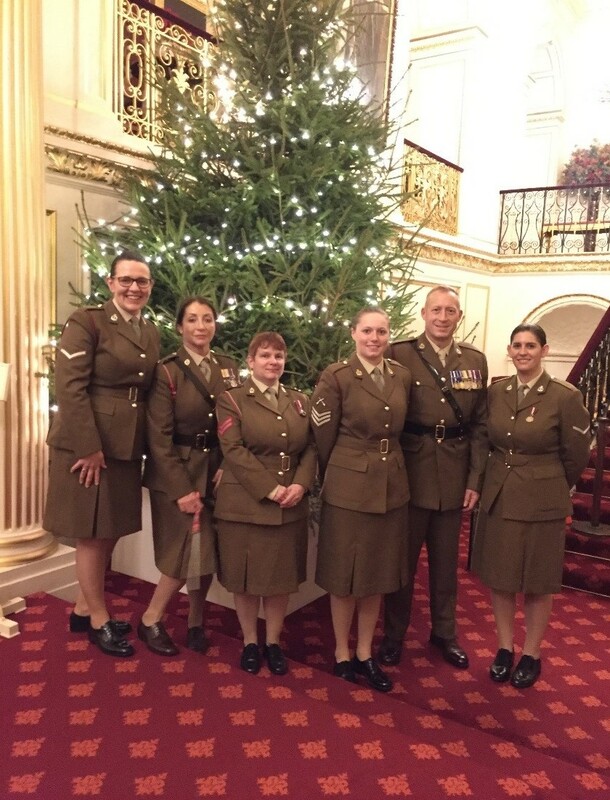 Members of 220 Medical Squadron, part of 254 Medical Regiment, were lucky enough to be invited to the Not Forgotten Association Annual Christmas party, held at The State Apartments in St. James’s Palace on Thursday 6th December 2018. 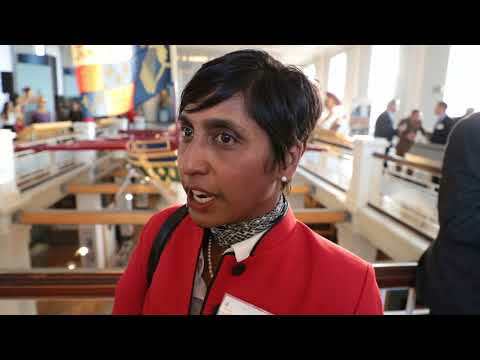 Held by kind permission of HM The Queen, in attendance were 305 guests, 35 Service Helpers, 63 performers and artists, over 40 military charities and organisations, and all representing the whole Armed Forces Community and Merchant Navy. We were hugely privileged that HRH Prince Michael of Kent attended to meet and greet many of the veterans that were present. The Not Forgotten Association (NFA) was conceived some 100 years ago. In 1919 the American Soprano singer, Marta Cunningham, was shocked to discover that there were thousands of wounded and lonely servicemen still in hospitals up and down the country. She went on to form the “NOT FORGOTTEN” Association for the ‘comfort, cheer and entertainment’ of the war wounded. This led on to the organisation of the first Royal Garden Party held at Buckingham Palace on the 12th August 1920. Within year some 10,000 men had been entertained. ​This was achieved by the generosity of other charities and the public, as well as support from the Royal Family. The NFA resulted, aiming to adapt to meet the changing needs of both veterans and serving members who are wounded and disabled. The day itself took place in the Throne, Entree and Queen Anne Rooms of the Palace, where guests were served a full afternoon tea complete with mulled wine and sandwiches whilst entertainment was provided by magicians, balloon artists, sketch artists and the Countess of Wessex's String Orchestra. The grand finale to the day was a variety performance of dance and songs within the Portrait Gallery of St. James’s Palace. This year, the NFQ was pleased to present Richard Arnold, Jean Martyn, Margaret Keys, James Fox, Froback dance group, Boney M and Major Dixie Ingram who all provided a brilliant show. 220 Medical Squadron have had the privilege to be invited to help and support the two-main annual NFA events over many years, including the Royal Garden Party held at Buckingham Place in the summer. This is all due to our ex Honorary Colonel, Colonel Piers Storie-Pugh OBE TD DL, who was the Chief Executive of the NFA from January 2011 to 2016. He commanded his Territorial Army Battalion 1991-1993 and was then appointed Deputy Commander 2nd Infantry Brigade and TA Colonel 4th Division 1994-1997 in the rank of Full Colonel. He became the Reserve Forces representative on the Control Board of the Army Benevolent Fund in 1995 and was appointed ADC to HM The Queen in 1996. He is currently a Reserve Forces Honorary Colonel. 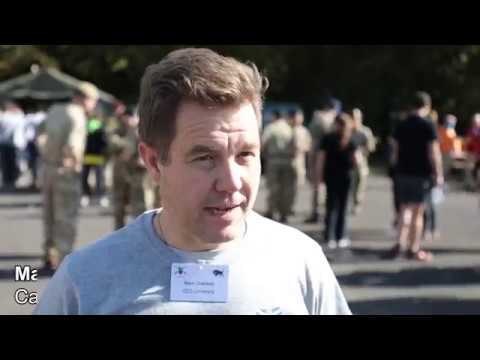 When attending both NFA events, members of 220 Medical Squadron are allocated different tasking’s throughout the day, this could include helping veterans up and down the stairs or mingling when the guests have been seated. A lot of the veterans want to speak to serving personnel and share experiences. Furthermore, we are sometimes asked to line certain routes for the Royal Dignitaries such as HRH Prince Michael of Kent when he departed through the Palace. He spoke to many of the serving volunteers who had helped throughout the day. We are always honoured to be invited to such prestigious and humbling events organised by the NFA; 220 Medical Squadron hopes to carry on supporting such an important cause and organisation in the forthcoming years to help educate the community and help the NFA in their aim to ‘find the forgotten and combat feelings of isolation and loneliness’. 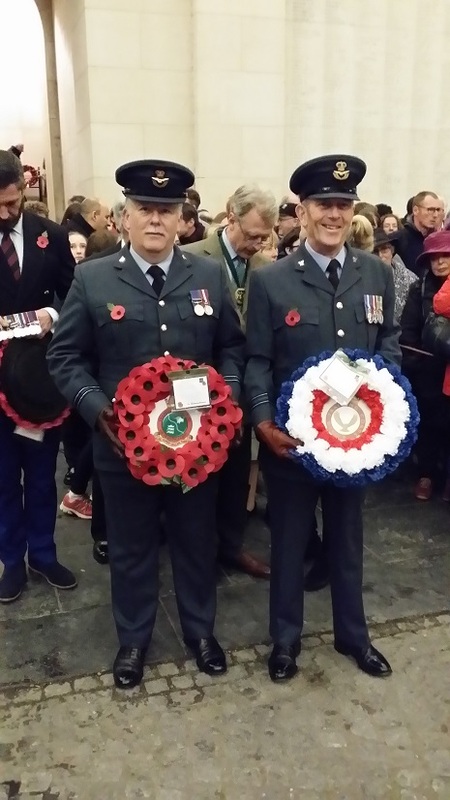 On Friday 25th Oct 2018, 77 staff and cadets from Hampshire and Isle Of Wight Wing Royal Air Force Air Cadets commenced a two day visit to Ypres and Passendale. During the course of the trip the cadets visited a number of different WW1 locations, Essex Farm Cemetery (where Lt Col John McCrae wrote his poem “ In Flanders Field”), the German Cemetery at Langemark, the British Cemetery at Poelkapelle, where at the grave of Private John Condon aged 14 (at time of death), four cadets of similar age to him laid a wreath. Visits were also made to Tyne Cot Cemetery, Flanders Field and the Passendale Museums. However the highlight of the trip was taking part in the Last Post Parade at the Menin Gates where Sqn Ldr Brian Swan Deputy OC Hants & IOW Wg laid a wreath on behalf of all staff and cadets from Hants & IOW Wing. 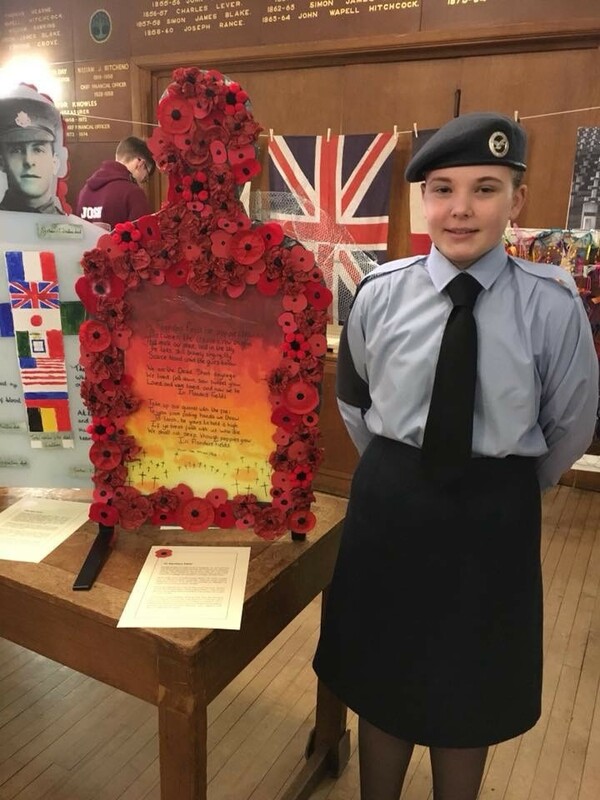 Cadets from 606 Air Cadets in Beaconsfield have been helping Oxford University “Lest We Forget” Project which is aiming to digitalise memorabilia from WWI before it is lost. As such they are part of the Beaconsfield WWI Commenaration Group, it has been decided that the items we had recorded would go on display. The main issues whilst we were originally planning was that we had more stories than items and we weren’t sure how to bring them to life. At the same meeting the church raised they had been donated 15 There but There Soldiers instead of 5. I asked if we could use them to display the stories. We were then given 10 to create a temporary display with. We gave one to each flight on the Squadron, then groups of cadets/individuals took the other ones to design. We also have one to the local Volunteer Police Cadets to design. They spent a few weeks researching, putting on sticky back plastic as they were going to be temporary. Then numerous decorating, building, creating them. They also had to provide a write up on what inspired them. They went on display at the Town Hall for two days, and then we got a request if they could be used for the Veterans Lunch on Rememberance Day. Then we received an email stating that it had been decided that it would be a shame to take the designs off them, therefore they had been donated back to the Squadron. However we’ve received an additional email from the Town Council today saying that they have received so many requests about the exhibition they are looking at ways to put it back on. 151 Regiment RLC will be participating in the Lord Mayor Show on Saturday 10th November 2018. 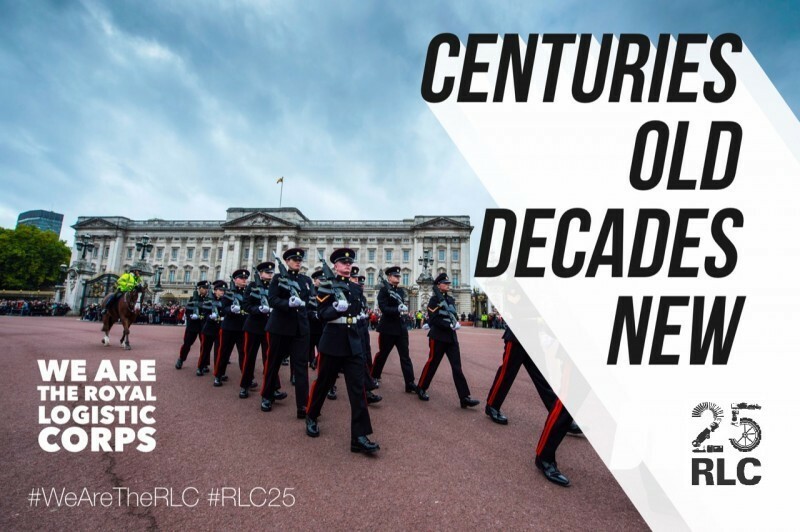 This year’s display is inspired by the RLC’s 25th birthday message. ‘Centuries old, Decades new’. We have a fantastic history going back centuries. The achievements of the Corps since forming in 1993 are exceptional and worth celebrating to inspire those who will serve through the next 25 years. The unit will be position number 77 in the parade. The RLC contribution sequence is a Tank Transporter, a Rolls Royce and Bedford Fuel Tanker. The Tank Transporter- the RLC’s Heavy Equipment Transporters, crewed by two specialist drivers from 27 Regiment RLC, weighing almost 47 tonnes un-laden. Capable of carrying all of the Army’s tanks and armoured vehicles. When fully Laden they can weigh nearly 120 tonnes. Monty’s Rolls Royce- - Built for a long-untraceable woman in 1939, this Rolls Royce Wraith was commandeered by the Ministry of War-Transport on 24th January 1944. It’s a 1½ ton Park Ward bodied light Limousine, with a 4275cc engine, with light tan leather seats and hand moulded wooden trim. In 1944, Field Marshall Montgomery (the most important solider in the British Army and one of the key members of the planning the Allied invasion of Europe), left behind the Humber staff car he had in North Africa and settled for this Rolls Royce for something grander and more impressive. A Vintage Bedford Fuel Tanker- The tanker from 1952 supported operations in Northern Ireland in the 1960’s, shows a small cross-section of the huge variety of ‘stuff’ the Army needs in order to operate. From tanks and ammunition to letters and food, we get the right amount of the right kit to the right people in the right place at the right time- which enables the Army to do its job, whilst boosting morale in the process. We fight logistics through to keep the Army operating, mobile and in communication. 151 Regiment, RLC is London’s only logistic unit. Based out of 5 Army Reserve Centres (ARC) across Greater London and South East of England. Its deployable role is sustaining ‘The Iron Division’ – 3rd (UK) Division, the British Army’s high-readiness armoured war fighting formation. 151 Regiment proudly traces its origins and affiliations within the City of London back to 1801 and the formation of the Royal Wagon Train in Croydon.